Practicing number recognition and counting skills with preschoolers becomes even more fun when snacks are involved! 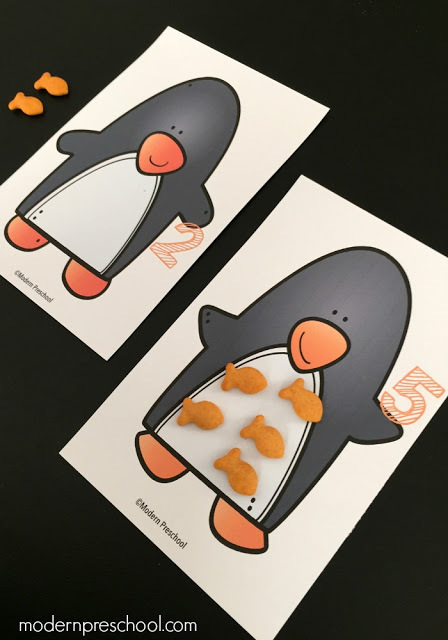 Our free printable penguin counting mats are perfect for a busy bag at home or an independent learning center in the classroom. They fit into a bird or winter theme and are super duper cute! Feeding the penguin fish crackers is silly, fun, and ends with a yummy snack! 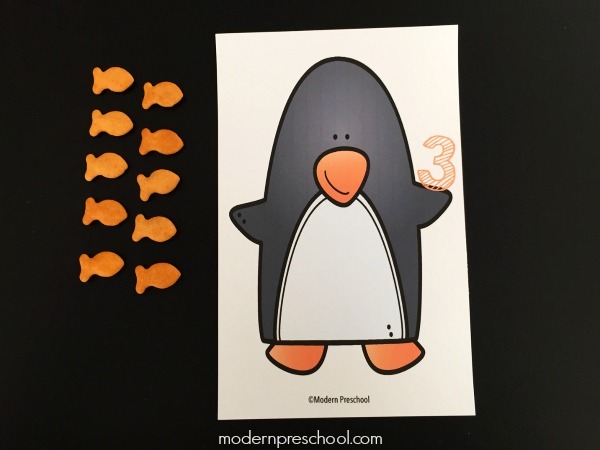 The set of printable counting mats includes 10 penguins. Each cuddly penguin is holding a number 1-10 indicating how many fish the penguin needs to eat. Download the file below and print the counting mats on cardstock. I recommend laminating the mats before play. If you don’t have a laminator (grab this one if you are thinking of buying one! ), use a plastic page protector or even a ziploc bag to protect the penguins from greasy spots that the fish crackers may leave. Before playing, have your child count out 10 Goldfish crackers, Swedish fish, or any fish shaped snacks. This will make it easier for younger children to use a smaller pile of fish to count from. The activity is simple set up and now it’s time to play! 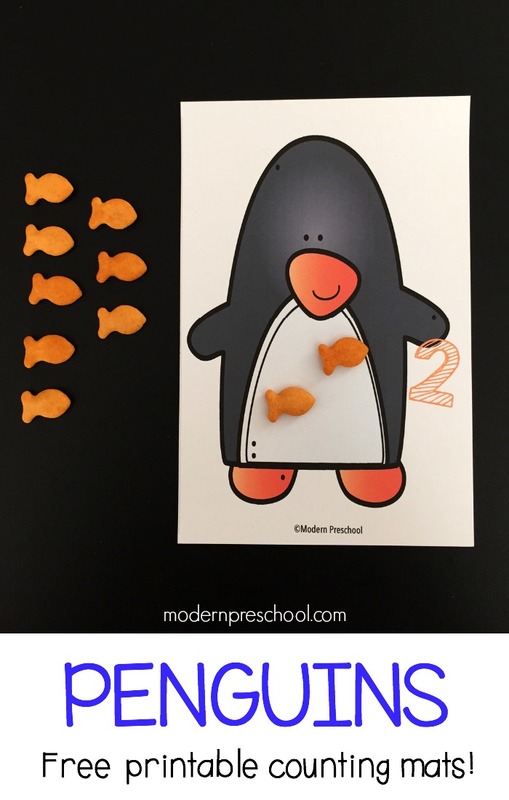 With each new card, preschoolers can practice counting their fish as they place them on the penguin counting mats. To help with understanding 1:1 correspondence in little learners, count in rhythm. Place the fish and count a number — place and count, place and count, place and count each fish. 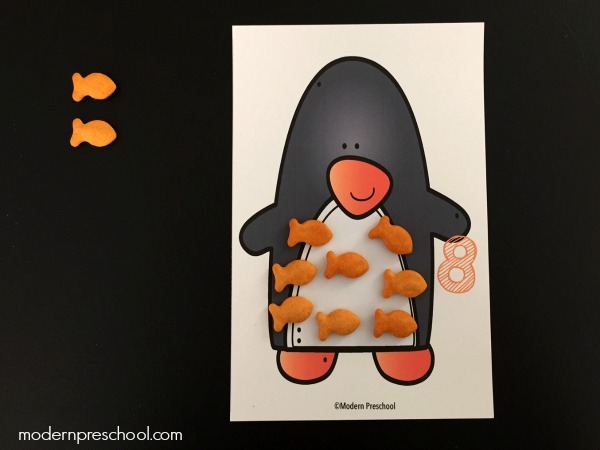 For extra number counting practice, have your child count the fish one at a time as he takes them off of the penguin mat and places them back on the table. This will also help with number recognition! My preschoolers are going to love counting with fish. The bonus will be an extra little snack during the day! Penguins are always a big hit with my preschoolers. 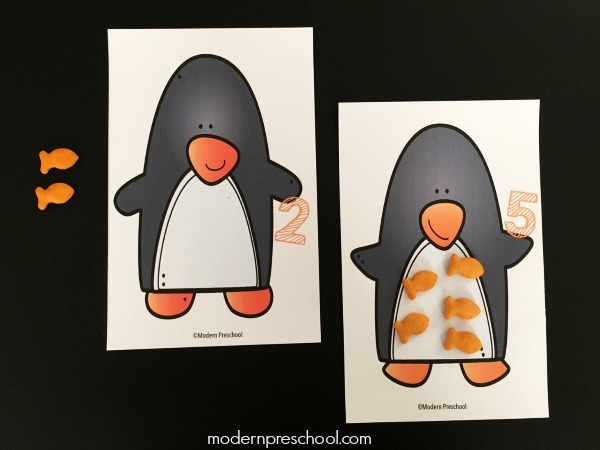 Maybe it’s the gross motor fun we have when waddling, the fact that penguins slide on their bellies, or that we get to eat goldfish crackers while we learn. Now matter what, penguins are an engaging theme for little kids. 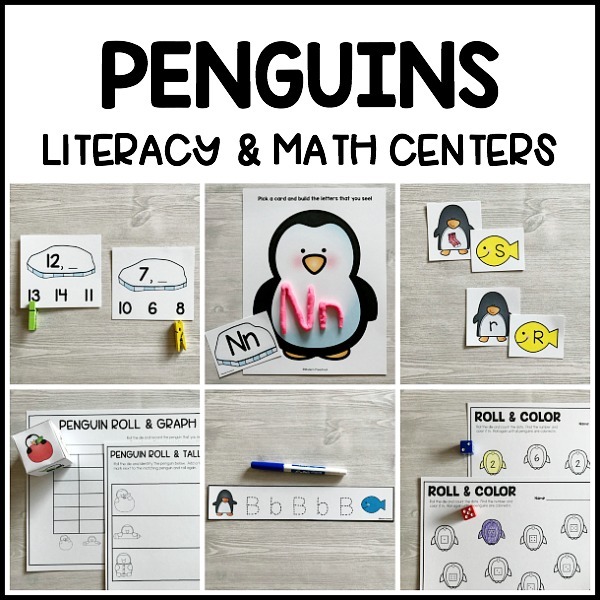 Learn more with our penguins literacy & math centers. These are a time saver, include vocabulary cards, differentiated activities, and motivating ways to work literacy and math skills into learning centers! Or wait…here’s my absolute favorite penguin set! 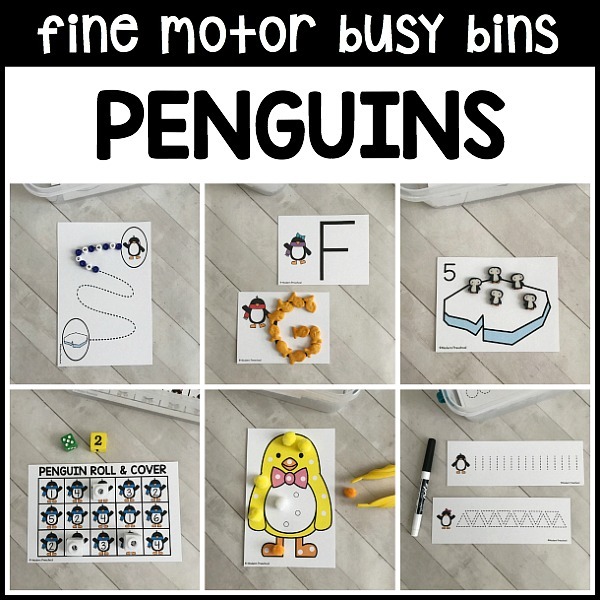 Our 12 penguins fine motor busy bins include simple activities for preschoolers to practice fine motor skills. They are created for pre-k kids to work independently, as well as younger preschoolers to work in small groups with. Our fine motor busy bins are hands-down the absolute favorite of all preschool and kindergarten teachers! Don’t forget to grab your set of penguin counting mats at the pink button below! These are adorable! Would love to print these for my four year old, but the PDF file isn't working… Can you help? Pinned & shared 🙂 Thanks! Mary C.
Hi Mary! When the file opens, make sure to download it to your desktop, or click the print button on the screen so it pops into a new window. Email me with any other issues! Love this! As a preschool teacher, it is hard to find these counting mats that go to 20 for the higher kids. Do you have 11-20? Clicked on “Download here”, entered my email….and nothing happened…the box stayed….